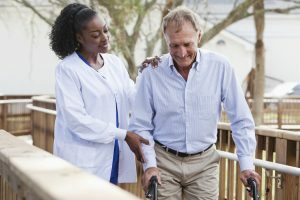 Home Care Aides can help with everyday housekeeping and personal care tasks as well as provide transportation for shopping or appointments. Working as a Home Care Aide offers meaningful employment while making a difference in the community. How’s Work was founded to provide Homemaker services to at-risk elders for Mystic Valley Elder Services in 1993. In the 20 years since the business has expanded since to provide a variety of non-medical Home Care services in a number of Eastern Massachusetts communities. Founded by Pamela Abernathy, the company is a Massachusetts certified woman owned business (SOMWBA) and continues to be family operated today. Please take a look around our site to find out more about Home Care services or employment opportunities. How’s Work is proud to use HomecareIT – Home Care Software as a service from IT Resources in Lexington, MA. With this software Home Care Aides can quickly clock in and out of their client’s homes with a toll free phone number. Each call takes only a few seconds to complete and provides the office with accurate, real-time service records. Sometimes it’s just daily tasks that you or your loved ones need assistance with. Personal Care services are non-medical assistance with Activities of Daily Living (ADLs) like bathing, grooming, and dressing. Proper nutrition is vital for elders living on their own. Meal Preparation service is both a helping hand in the kitchen and a helpful reminder that it’s time to eat. Grocery shopping can be physically challenging for many elders. Our shopping service can assist by helping to make a grocery list, doing the shopping, and putting away the groceries. Visits to doctors and other appointments can be difficult for some elders to manage alone. Our companions provide one-on-one round trip accompaniment for shopping and appointments. Often times your needs can’t be covered by one single service type. For example maybe assistance is needed with both Personal Care and Shopping. Chore services are heavy cleaning and work that involves lifting or kneeling. Examples include scrubbing floors, cleaning out refrigerators, moving furniture, or packing boxes. At Home Visitation for socialization and stimulation, or accompaniment to give relief to a caregiver. Homemaker services include most aspects of basic housekeeping.